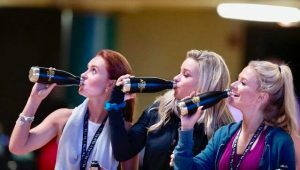 Following day three of Miss America in Atlantic City, rehearsals officially started. 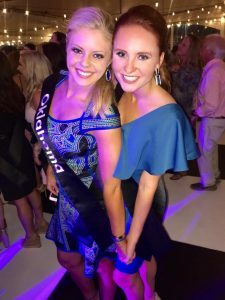 That fourth day, Friday, August 28 we (as candidates) got to enter into the boardwalk hall ballroom to practice walking patterns and the opening number for the 2019 Miss America telecast. 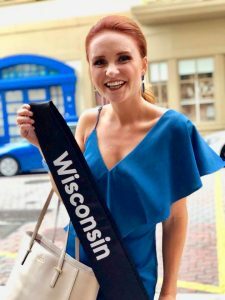 A special thank you to Oshkosh, Wisconsin based 4 Imprint for generously creating a number of Miss America items for all of us 51 candidates including water bottles, portable chargers, fleece blankets, and blow-up neck pillows to keep us comfortable, refreshed, and energized for long rehearsals. 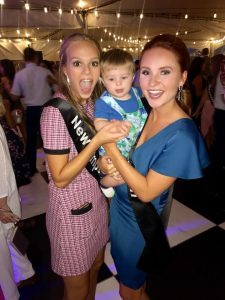 As we rode up the escalators and entered into the rehearsal space, I was overwhelmed at the grandness of the space, the historic value of the room, and the aroma of breakfast (let’s be honest, despite all the stereotypes…pageant girls DO love food). Rich, distressed wood flooring lined the ground beneath my feet and as I turned my attention upward up to see a large chandelier light fixture, I at first glance thought the ceiling paint was peeling. Upon a heightened observation, I discovered the magical zodiac signs, clouds, and sun beams that were spanning across the room’s ceiling. “The very center of the ceiling between the two lights is a gold sun with rays beaming outward toward the corners of the room, touching the clouds; providing a whimsical, Greek mythology vibe.” That first rehearsal day we specifically learned the walking patterns for the LIVE parade of states, rather than being pre-recorded like in years past. 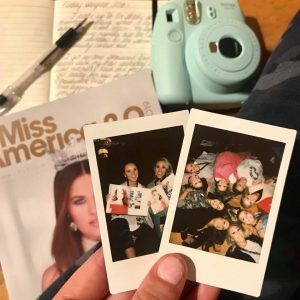 We received our official Miss America competition magazines, we spent a good portion of the day breaking into our three respective groups – Alpha, Sigma and Mu to go over different walking and stage placements. During breaks, I tried my best to continue relaxing, staying up to date on journaling (pictured right), and progressively getting to know my incredible sisters. Friday evening we enjoyed dinner with chamber personnel and community members at a clam bake just outside of Harry’s. …better, we returned to our hotels to meet with our host mamas and received custom, three-piece state bracelets from Rustic Cuff. The first bracelet included pewter beads with a gold plate that had “Wisconsin” engraved upon it paired with a grey leather crystal bracelet and a gold beaded bracelet. 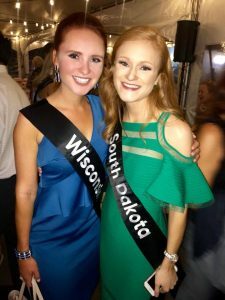 I went to bed in awe at the love and support I felt from sponsors, volunteers, my friends and family back home constantly sending me messages, and the other state titleholders; eager for the following day’s agenda.